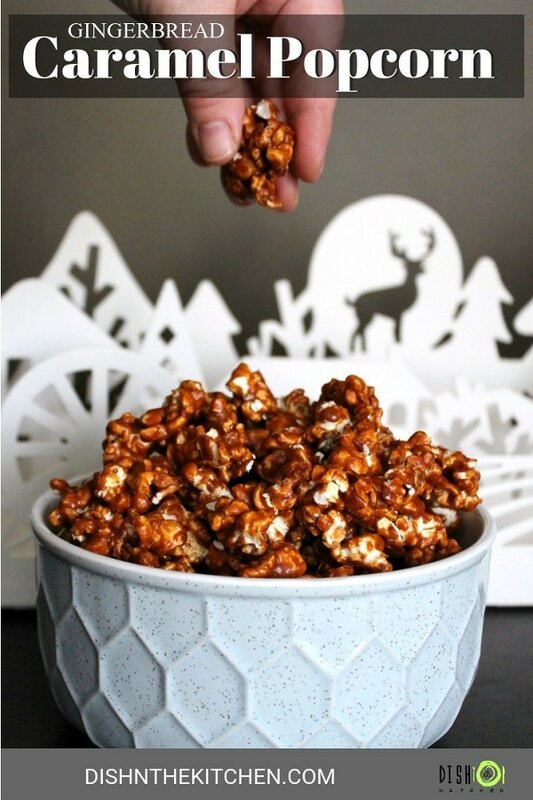 A delicious crispy, crunchy, buttery, Gingerbread Caramel Popcorn with warming Gingerbread spice. Pair it with your next Netflix binge and Chill. Food inspiration is all around me. Not only do I find inspiration from other blogs and multimedia but many times it’s that in-person experience that inspires me the most. Maybe it’s my style of learning…as mirrored in the 4-H motto ‘Learn to do by doing” (yes, I was a 4-H kid!). When I experience something particularly delicious it just sticks with me. There are some food experiences that have remained ingrained in my brain for years! Two years ago I visited Bread and Circus Trattoria for the first time. It’s a cozy space where you can experience authentic flavours of Rome, courtesy of Chef Kayle Burns. The pasta is fresh and the flavours are like a warm hug from your Nonna. 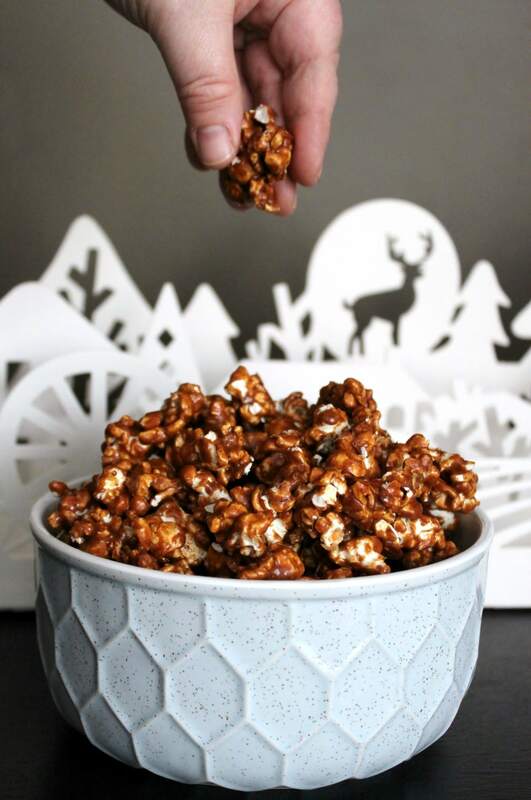 Every visit ends with a special treat: Gingerbread Caramel Popcorn. 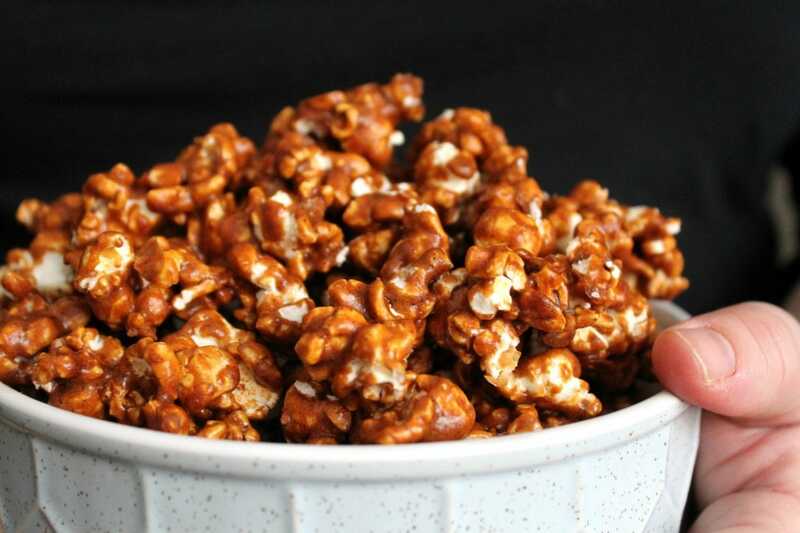 How Do you Make Caramel Popcorn? Truthfully, this is the first time I’ve made caramel popcorn. It’s so much easier to make than I thought it was. Before making the caramel sauce, be sure to pop all the popcorn and have it waiting in a large pan. 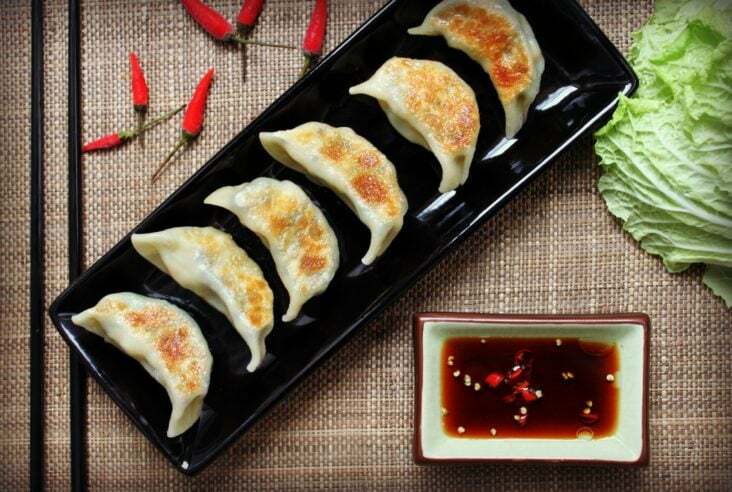 The sauce is like any other caramel sauce, you could omit the gingerbread spices here or even add your own flavourings. 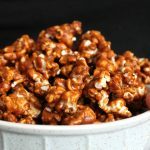 How Do You Make Caramel Popcorn Crispy? No one likes soggy popcorn! It’s somewhat important to cover as much of the popcorn as you can with the caramel sauce. Don’t worry if you don’t because that special crunchy texture of happens during the baking phase of the recipe. The sauce will liquefy slightly and will cover the popcorn as you stir. How Long Does Caramel Popcorn Last? This is a non-issue. 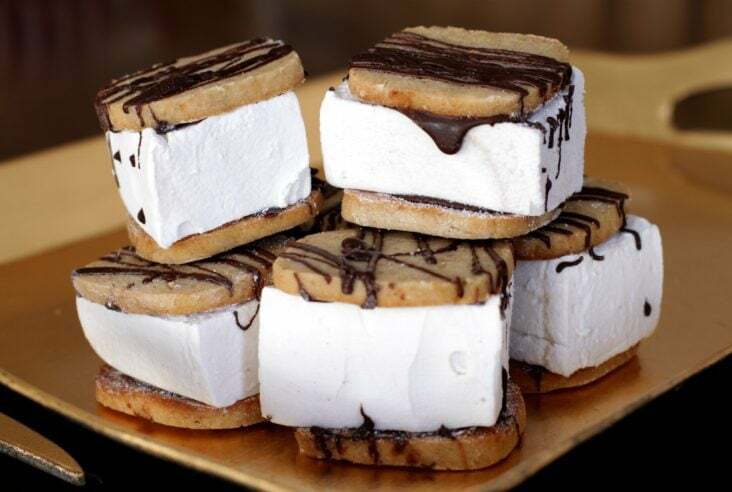 Seriously, you’re going to want to binge eat it all in one go. I recommend pairing it with your favourite Netflix series or Christmas movie. In the event that you are preparing it ahead of time or gifting it to some lucky soul, it will keep in an airtight container for 2 weeks. 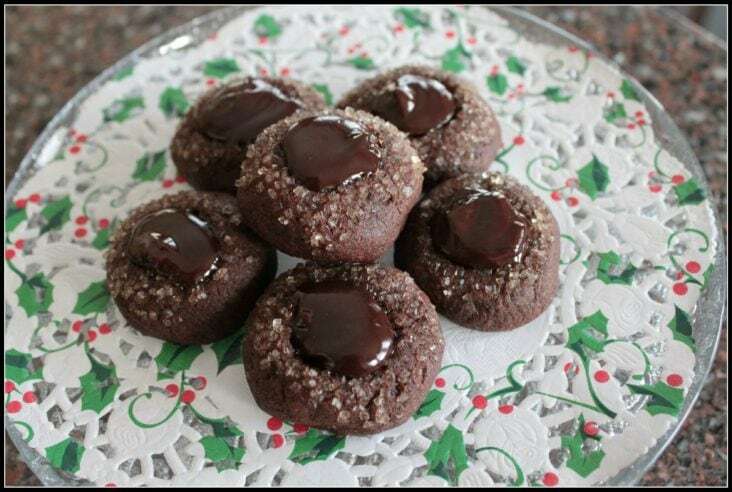 The aromas of holiday gingerbread fill your house and warm your soul. Great for gifting for friends or chowing down on in front of your favourite Christmas movie. 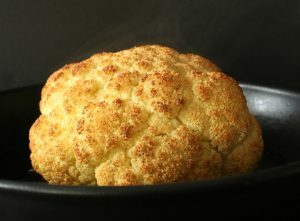 Place popped popcorn in a large roaster (or other such large vessel) that has been coated with non-stick cooking spray. Set aside. Line two baking sheets with aluminum foil and spray with non-stick cooking spray. Set aside. Place all other ingredients (except baking soda and vanilla) in a heavy bottomed saucepan and heat over MED heat, stirring to mix ingredients. Bring to a boil, then boil without stirring for 4 minutes. Remove from heat. Stir in baking soda and vanilla. Pour immediately over the as much of the popcorn as you can, then mix as well as you can. Move the popcorn over to baking sheets, taking care to spread it out evenly. Bake for 1 hour, stirring every 15 minutes. This should help with the redistribution of some of the caramel! Let it cool, then break apart any large clumps.